You’ll come back to this basic granola recipe time and time again- it’s simple and so good. 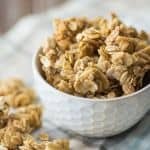 Big clusters of crunchy oats and almonds, lightly sweetened with honey and brown sugar, with just a hint of warm cinnamon. There’s nothing fancy about this recipe. It’s about as basic as it gets. I love brunch food and I’ve got plenty of fun and unique breakfast ideas on this site to prove it. But sometimes you just wan to keep it simple. 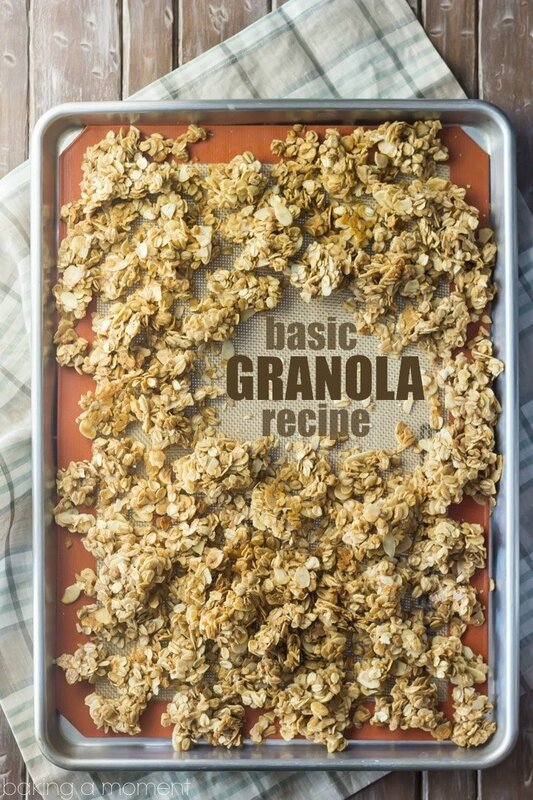 I love this granola because it’s so versatile. It tastes good paired with all kinds of fruit. It works just as well with tropical pineapple or mango as it does with apples, cherries, or lemon. Tops for yogurt parfaits, plus it’s great cold or warm. Lately I’ve been adding a little milk and heating it slightly in the microwave- so comforting! It softens up a little bit but still has a great hearty texture. If you’ve never made homemade granola, I urge you to try this recipe! It’s so quick and easy (we’re talking 10 minutes of active time), and nothing store bought could ever beat the taste or crunch. Plus you can totally put your own spin on it. Add dried fruit, seeds, coconut, nut butters, even chocolate- the options are limitless! Preheat the oven to 300 degrees F, and line a baking sheet with a silicone mat, parchment, or foil. Place the oats, almonds, brown sugar, cinnamon, and salt in a large mixing bowl and toss to combine. Stir the melted butter, honey, and egg white together, and pour into the oat mixture. Transfer the mixture to the prepared baking sheet, spreading it out in an even layer. Bake for 30 minutes or until the almonds look lightly toasted. Cool completely on the baking sheet, then transfer to an airtight container. Keeps for 2 weeks at room temperature. Allie, I love this! like you said, this is so versatile and you can add so many things! love this recipe! Homemade granola is the best! Love the big clusters! Isn’t it though? Thank you so much Jessica! Thank you so much Summer Daisy! Those clusters are SERIOUSLY on point. I love and good, crunchy and SUPER chunky granola, so this looks perfect! Pinned! It’s gotta be chunky for me. This recipe really holds together in big clusters, and I love that! Thanks so much Taylor! Homemade granola is just the absolute best! I love all those chunks!! A must for any granola for me!! Me too Ashley! I love when it’s big and cluster-y. I’m so happy you like this; thank you! 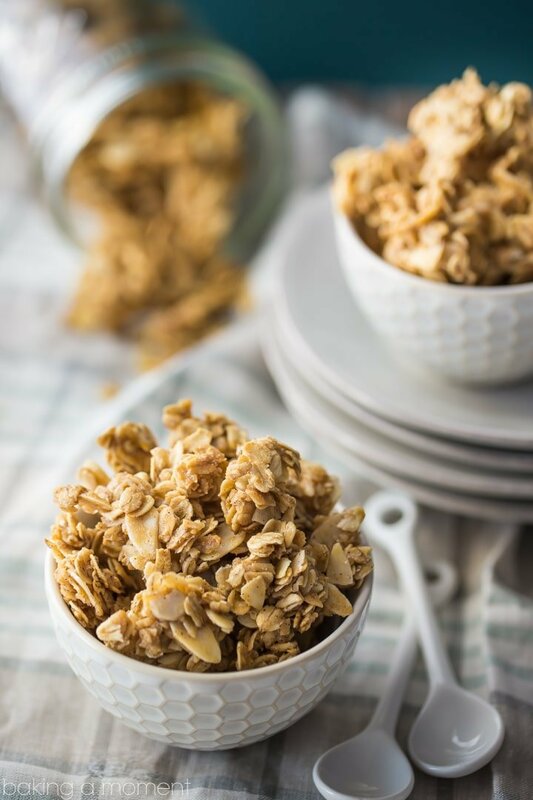 You can’t beat homemade granola, and it’s great to have a base recipe like this one that you can customise to suit, it looks perfectly crunchy and delicious! 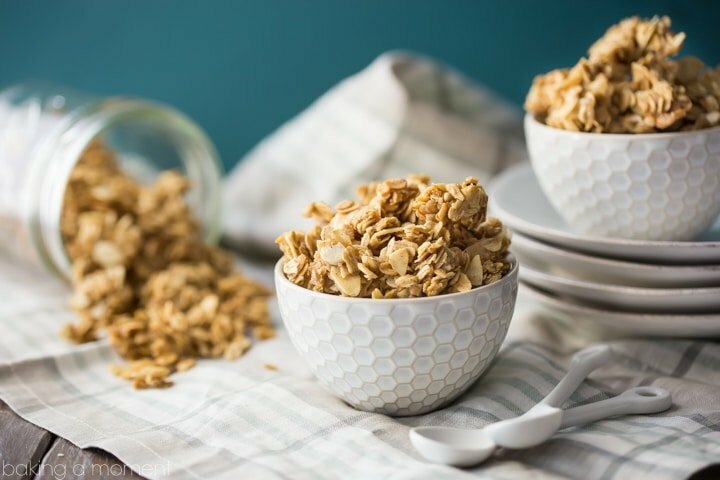 This granola is so classic and looks like an absolute amazing way to start the day! Looks good. What purpose does the egg white have? Thanks Ruth! The protein in the egg white helps to hold the granola together. If you like big hunks (like I do!) then I think the addition of egg white will really work for you! Can you use something like coconut oil instead of the butter? I haven’t tried it myself but I really like that idea! Can’t imagine why it wouldn’t work… If you try it, let me know how it works out, ok? Thanks so much Courtney! Hi, can’t wait to try this recipe! quick question: do you think I can use canola oil or light olive oil instead of butter? Hey Mariam! Thanks for the great question and my apologies for the late reply- I’ve been traveling. I haven’t yet tried this recipe with oil, but I can’t imagine why it wouldn’t work! Let me know how it works out for you. Thanks! They should work just fine Cindy! I just prefer the chewier texture of the old fashioned oats. But quick will work in a pinch! A teaspoon of extract is good for most recipes. Good luck and enjoy! Could you do all honey instead of adding in brown sugar (if trying to avoid refined sugars)? Hi, I am definitely going to try this recipe, but I don’t want to use egg. Can I either omit it or use a substitute? and what can I substitute egg with? Thank you. Hi there! You can probably omit it, although it may not be quite as “cluster-y” in that case. Good luck and I hope you enjoy! It is indeed delish! I may be in the minority but I am not fond of clusters in my granola so I take a rolling pin to the finished product & break it up a bit. Hi does it have to have the egg whites though? You can leave it out Nickisha, but you probably won’t get the big clusters without the egg white. If you added other nuts, seeds and raisins, would you add them before or after you baked it? Hey Nancy! Thanks for the great question. For nuts and seeds, I’d add them before baking. For raisins or other dried fruit, I find that can get bitter and overly dry in the oven, so I usually mix in after it’s all cooled. Good luck and I hope you love this recipe as much as I do! This recipe looks delicious and simple! My boyfriend works at sea so when he comes home I like to spoil him with as much homemade goodies as possible 🙂 I just have a quick question: it says that this recipe yields 4 cups but in the nutritional facts section it doesn’t specify the serving size. So I’m just wondering if the 691 kcals are for one serving (and if so what size a serving would be) or if there are 691 kcals in the entire 4 cups. Thanks in advance, I can’t wait to try this recipe out! So happy you like it! I think that the way my plugin works, that would be 691 kcals per cup. A cup might be a somewhat large serving size, so bear that in mind! Hope you and your boyfriend enjoy! Hi. This looks so good. I am looking to make a no nut recipe. If I omit the almonds do you think I should add more oats? Hey Judy! That sounds like a great idea. You could also substitute with some kind of a seed, like possibly pepitas or sunflower seeds. This recipe is really versatile so feel free to make it your own! Does the granola stay crunchy in the airtight container? Thanks / Is the nutritional information for the whole recipe? Hey Kim! This nutritional info is for one cup of granola. I find it to be really filling and usually eat about 1/2 that for breakfast. I started making my own Greek yogurt and this topping is perfect. I am currently making my second batch in two weeks. Thanks for posting this. That sounds fantastic! I have never made Greek yogurt but it sounds like a really fun project. So glad you’re enjoying this granola! Thanks for the 5-star review!